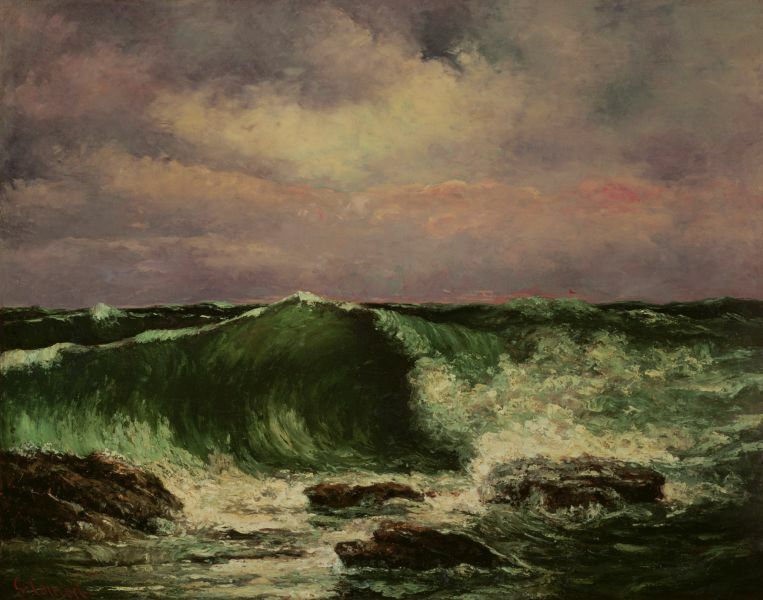 "in asmuch as the Vendôme column is a monument devoid of all artistic value, tending to perpetuate by its expression the ideas of war and conquest of the past imperial dynasty, which are reproved by a republican nation's sentiment, citizen Courbet expresses the wish that the National Defense government will authorise him to disassemble this column." "Napoleon erected the present column to celebrate the victory of Austerlitz; its spiralling veneers of bas-relief bronze plates (by the sculptor Pierre-Nolasque Bergeret) were made out of cannon taken from the combined armies of Europe, according to his propaganda. (The usual figure given is hugely exaggerated: 133 cannon were actually captured at Austerlitz.) After the Bourbon restoration the statue of the Emperor was pulled from the top of the column and refinished as a statue of Henri IV, which can be inspected on the Pont Neuf. A replacement statue of Napoleon, however, was erected by Louis-Philippe, and a better, more augustly classicizing one by Louis-Napoleon. 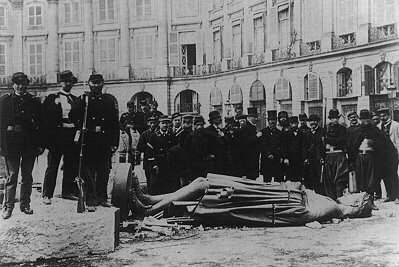 on April 12, 1871, the dismantling of the imperial symbol was voted, and the column taken down on May 8, with no intentions of rebuilding it. The bronze plates were preserved. After the assault on the Paris Commune by Adolphe Thiers, the decision was taken to rebuild the column with its statue of Napoleon. On his own previous proposition, Gustave Courbet was condemned to pay part of the expenses, which ruined him. Today the Place Vendome is famous for its fashionable and deluxe hotels: The Hôtel Ritz Paris, which is THE Ritz, and the Bristol, which Edward VII preferred, now called the Vendôme. Many famous dress designers have had their salons in the square. Place Vendôme provided a title for a 1998 movie starring Catherine Deneuve." Creepy--I was thinking about doing a Courbet/Paris Commune post soon myself, no joke ... I'll be back with more commentary tomorrow. 1) I was struck (but perhaps shouldn't have been) by how much the right, in 1870s France, employed rhetorical tactics similar to the American right today. Maxime du Camp sarcastically defended the privileged by saying that their privileges were actually responsibilities, and that the bourgeoisie, the Church, etc. ran many risks because of ungrateful, idiotic, uppity workers & socialists. 2) When, say, Zola or other writers of a liberal-reformist persuasion wrote on the Commune, they seem to be oh so moved by the "horrors" of the struggle--the piles of dead bodies (i.e. the bodies of Communards slaughtered by the state), and though they are moved to great depths of compassion for all those who have suffered, they never think to pick up a rifle, raise a voice, and join the Communards.